The trek to Base Camp begins! It’s the 1st April and we are now in Namche Bazaar, altitude 3500m. No joke!! But let’s go back a bit.. The 30th March and we were up at 5.15am, and downstairs to meet Mohan. With all our kit now piled into the taxis, we headed off to Kathmandu airport. It took us a while to get though security at check-in, as our bags way over limit… again! In the departure lounge, we now had to wait it out. With the weather in Lukla unpredictable, flight departures were dependent on the weather conditions for landing. 4 hours later, we were told that there were no flights in to Lukla for the day. This did not come as a surprise, as this often happens. The weather changes hourly in the Himalayas! We returned to the Eco Lodge and checked in for another night. Next morning 530am, we were up again, and the same procedure! This time we were receiving regular updates on the weather from Pierre Joker in South Africa. Unfortunately, it did not look good, and we prepared ourselves for another long wait. In departures, and after 2 hours, our flight was called! Time to board! We all grabbed our kit and boarded a bus for the plane. At the plane we were told to wait in the bus until we were called. 30 minutes later, we returned to the departure lounge. Lukla had clouded over. No flights yet.. Another wait. An hour later, we were called and the same thing! Off to the plane. This time we got out the bus and climbed aboard. We were now going to take off! Or were we….? Another call, and it was off the plane and back to departures!! Another call, and the flight was back on!! 4th time lucky!! We climbed aboard and the plane taxied away. This time there was no turning back! 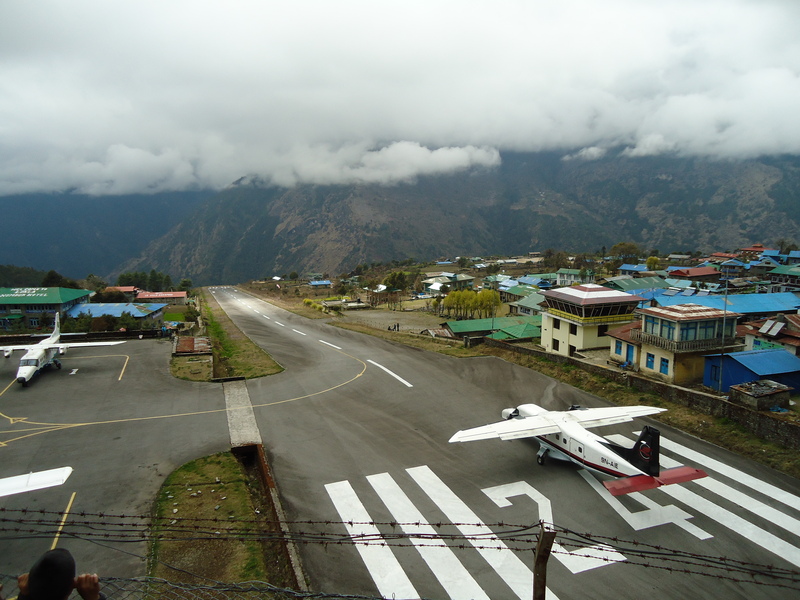 Now Lukla airport is known as one of the top 3 most dangerous landing strips in the world. Some say THE most dangerous! The flight took us about 40 minutes, and the pilot had to swerve quite a bit to avoid the clouds. The approach was radical, as we dropped in to a valley and turned right on to the approach! 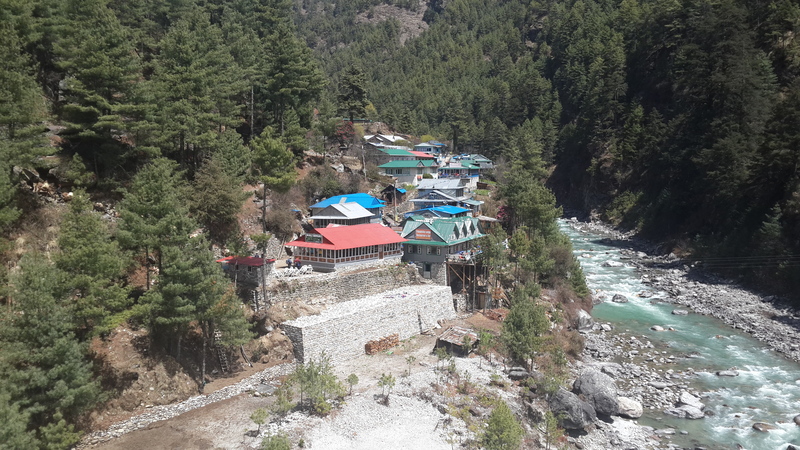 There is no change for a go around at Lukla, and once committed, we were landing! The runway is about 120m long and as the wheels touched down, the pilot hit the brakes! Unreal and what an experience! A short taxi and were outside the airport, safe and sound! 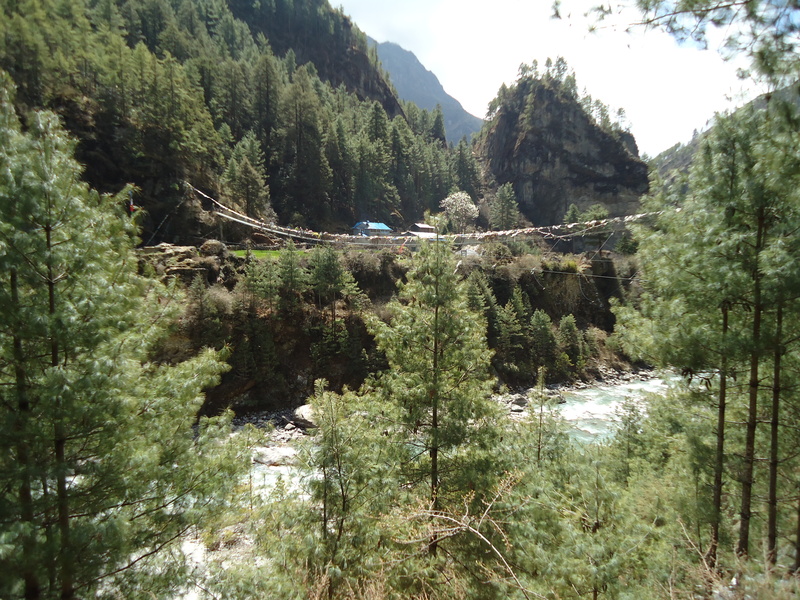 In Lukla, we had a lunch, whilst Sean recruited porters to carry the bags. The weather was closing in and soon we were on the trail to Phakding. Now I have done quite a bit of hiking, but this day’s hike was the best I had ever done. The mountains, the people, the Buddhist shrines, the yaks. I all added up to a fascinating day out. Well, it tuned in to a day night out as we only arrived in Phakding after dark! We checked in to a tea house, and after a fine dinner of eggs and chips, I was off to bed! Up early, we hit the trail to Namche. Now if I though the previous day was great, it got even better! 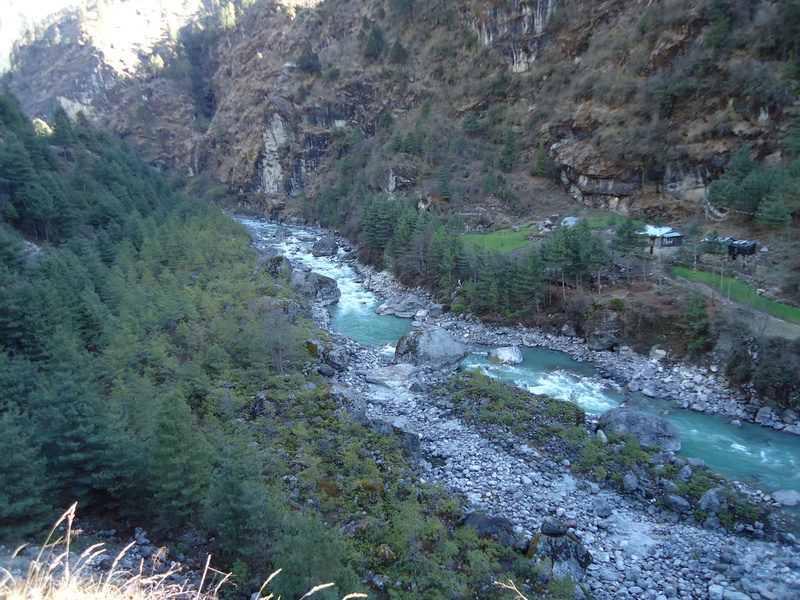 Huge clean rivers flowing down over rapids and waterfalls, suspension bridges up to 150 meters high, pine forests and tea houses. We passed through many small villages each with tea houses. Pray wheels and huge rock facings completely carved with prayer inscriptions were seen all along the trail. This stretch had it all. 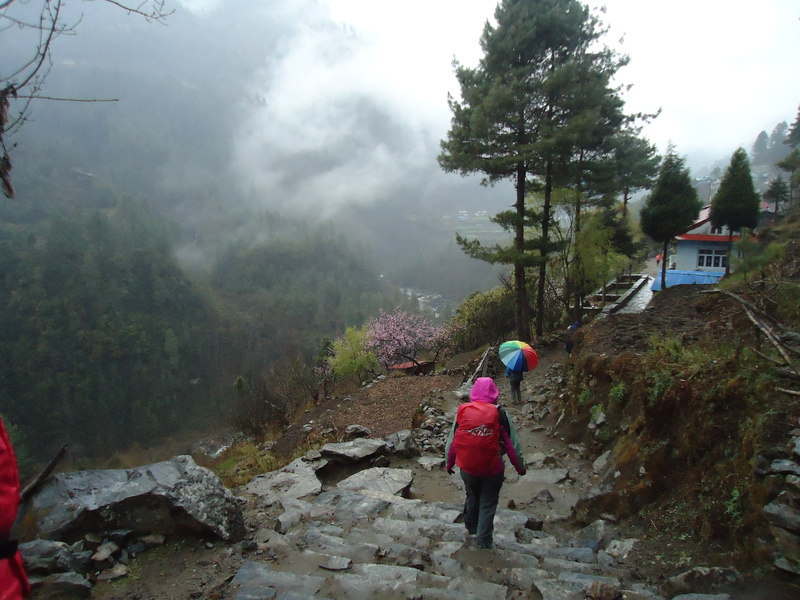 It also had a 2 ½ hour climb up to Namche and by the time we got in, our bodies had felt it! The path zig-zagged its way from the river up to Namche a climb of some 600 vertical meters. We got to Namche early in the afternoon and checked in to our guest house. Tea and later dinner was served as we all sat around the fire place and caught up on the days walk in. For me, a memorable one of note and a message goes out to all reading – You should try this. It’s stunning!! On the 2nd April, it was acclimatization day. Above Namche, and about 400 vertical meters is a tea house with a view sight of Everest and other large mountains in the area. At 7am were all set up. The idea behind this hike, not only to see the view, but to acclimatize. “Climb high, sleep low”. It was a 2 hour trek to the top, not far, but steep. After a slow slog, with each of us concentrating on our breathing, we arrived at the tea house. Unfortunately the clouds had moved in and Everest was nowhere to been seen. However we could identify a number of other peaks in the area, amongst them Ama Dablam. We all sat down to a cuppa tea or hot chocolate, before heading back down. Later that day we went down to a local bakery for coffee. It was Sean’s birthday and a little celebration was in order. Coffee and cake went down well, and then Bobby brought out Sean’s gift. As Sean had a pair of lime green trainers that could blind most, Bobby presented Sean with green gloves, lime green gaiters and a green beanie!! A great afternoon was had by all! As Namche was really our last opportunity to buy any supplies we needed, most went out and got what they needed. Back at the tea house, and after dinner, Sean briefed us all on the next days trek to Tengboche. We had all had an enjoyable 2 days at Namche Bazaar and I was now time to move on. Bed Time!! !